A.J. 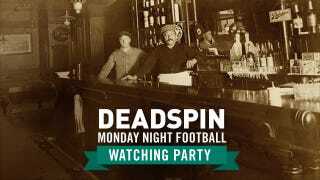 had put out the invite on Friday, so consider this your reminder to come meet up if you're in New York and you'd like to watch tonight's Bears-Lions game with a few Deadspinners and a handful of others from the Gawker gang. Just say you're there for the Deadspin thing and head upstairs. And don't forget to bring money because it's a cash bar and not some opportunity to freeload your way through Monday Night Football. Got it? Good. Hope to see you there.